Devon both ways severe disruption, on River Dart. Devon - Vehicle ferry not operating on Dartmouth Higher Ferry in Dartmouth on the River Dart junction, because of strong winds. Ben Field and Martyn Smith are charged over the deaths of two elderly neighbours. Photographs of Padstow fishermen have brought back memories of two tragedies which claimed the lives of five local men. Among those featured in a book of photographs are Kirsty Masters clutching a picture of her uncle who was among those who died in the space of a week in 1992. Kirsty said: "It's a massive loss, you don't get over it. "Because it was five local boys in one week the whole town was affected. "But a massive community spirit came because everyone was experiencing some kind of loss." The book, Sea, Salt and Solitude by Chris Hewitt, has been produced to raise funds for The Fishermen’s Mission, a charity providing welfare support to fishermen and their families. A primary school in Exeter was invaded by a flock of sheep on Wednesday morning. Stoke Hill Junior School, on Mincinglake Road, had its playground turned into a farmyard when 60 sheep were herded on to the school ground by a concerned member of the public. It's believed they had spotted the flock in the road and shepherded them through the school gates for safety. Police were called at about 08:00 to try and sort out the baaa-rmy situation. The farmer responsible was soon located and arrived to collect his sheep and they were safely back in their field by 09:15. M5 Devon northbound severe accident, at J28 for A373 Station Road. M5 Devon - M5 lane closed on exit slip road and slow traffic northbound at J28, A373 (Cullompton Services), because of an accident involving two vehicles. 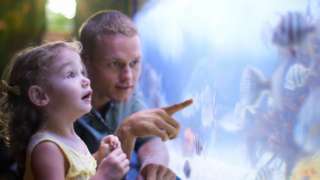 The UK's largest aquarium has blamed the summer heatwave for a fall in visitors. Showers will start dying out this evening to give a dry and clear start to the night. However, further showery rain will move in from the west, mostly after midnight. Cooler than last night but still windy. This tiny wartime building on Seaton seafront has sold in an online auction for £72,500. The former searchlight emplacement on West Walk was built in 1940 and formed part of a network of World War Two defences on the south coast. Auctioneers Lambert Smith Hampton described it as a 'rare opportunity to own a piece of British history' and suggested it could be converted for various uses, from a large private beach hut to a seafront café. It attracted 100 bids and the hammer finally went down at more than three times its guide price. 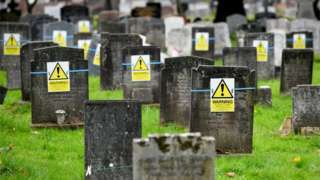 Radio Two presenter Jeremy Vine joins criticism of the warnings on 197 graves in Plymouth. Police are searching for witnesses of an alleged sexual assault on a woman in Barnstaple. It happened between 20:45 and 21:15 on Friday 26 October in the Newport Road and Hollowtree Road area of the town, police said. A 36-year-old man was arrested in connection with the incident but has since been released on bail until Wednesday 21 November. The big screen in Plymouth will be coming down next year, the city council has confirmed. Plymouth was one of eight cities chosen to host a giant screen as part of the build-up to the 2012 Olympics. Plymouth City Centre Company said “several key components” have failed and recently the screen has been “suffering from regular power outages”. It said much of the equipment was too old to be repaired and replacements were no longer available. “The screen has been in place since 2008 and has gone well beyond its expected lifespan,” it said. The National Marine Aquarium (NMA) is to cut staff numbers by about 10% to help balance its books. 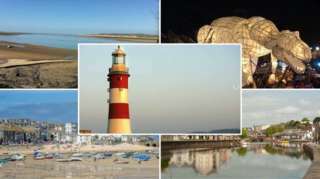 Up to 15 jobs will be lost at the Plymouth attraction, which is blaming the summer heatwave for a 15% drop in visitor numbers during May, June and July. Latest figures show the aquarium made an annual loss of more than £500,000. Roger Maslin, CEO of the tourist attraction, said staff have been informed of the "regrettable" need to resize the business and any job cuts were likely to be made by the end of November, depending on the outcome of a consultation process. He said: “The NMA is a charity that relies on ticket revenue from public footfall but as an indoor attraction the business plan is heavily dependent on the weather". 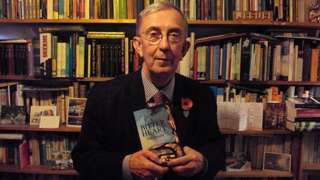 He added the cuts would "help future-proof the charity against increasingly dry weather". Thank you for sending in all your videos and photos of the waves and stormy weather this morning. Alan Wall sent us this great video of the waves thundering into the Dawlish coastline, and spraying all over the train tracks. Network Rail had closed the main line overnight and this morning as a precaution but trains began to use the line again from 10:00. 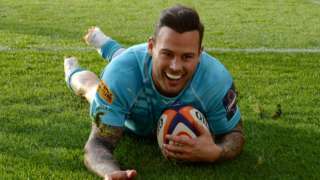 Worcester win at Leicester for a third successive time as they beat the Tigers 31-12 in the Premiership Cup. A car has been “completely destroyed” by a fire in Mid-Devon. Firefighters from Cullompton were called to Lower Town in Sampford Peverell at about 02:30 following reports of a burning car in a layby. Devon and Somerset Fire and Rescue Service asked officers to investigate the blaze as they believed the car may have been stolen. Police say that they are no longer investigating and have tracked down the owner. Two people have been taken to hospital in Cornwall following a two-car crash on the A30. Emergency services were called to the Roseworthy Dip between Camborne and Hayle at about 08:14 on Wednesday. The South Western Ambulance Service said that two people have been taken to Tresliske Hospital. Police said one man, believed to be one of the drivers, had been hurt but his injuries were not thought to be life-threatening. The other driver, a woman, was not injured. Officers warned drivers to take care in adverse weather conditions. East Devon District Council is spending nearly £25,000 a year on private security firms to patrol or protect council owned property. He said that the council spends £6,363.35 on security at The Knowle HQ in Sidmouth, £5,450.90 at Exmouth Town Hall, £7,200 at the Younghayes Centre in Cranbrook and £4,200 at the East Devon Business Centre in Honiton. Today will be rather cloudy and windy with blustery showers, some of which are heavy and thundery. However, there should be some sunny intervals at times too. Showers will become isolated by the evening.